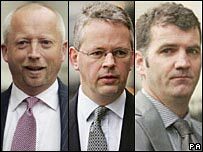 Three British bankers extradited to the US on fraud charges connected to former US energy giant Enron have pleaded guilty to one count of wire fraud. David Bermingham, 44, Gary Mulgrew, 45, and Giles Darby, 44, the so-called NatWest Three, were in a Texas court. Until now the three had protested their innocence to all seven fraud charges. Prosecutors say that in 2000 the three men advised former employer, NatWest, to sell part of a firm owned by Enron for less than it was worth. It is claimed that the three then left the bank and bought a stake in the Enron-owned company, before selling it on at a significantly higher price and making a huge profit. They were arrested in the UK in 2004. The case hit the headlines last year as the three men fought against their extradition to the US. They were extradited in July 2006 under a new fast-track system agreed by the UK government and face up to 35 years in prison if found guilty on all charges. They are now due to be sentenced on 22 February. 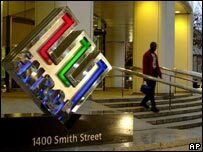 Enron, once the seventh largest company in the US, collapsed in 2001 with debts of $31.8bn (£18.3bn) after it was revealed that it had fraudulently hidden vast losses from investors.